UPDATE, July 28, 2017: As of the recent update 6.66, Doom now has upgraded, reworked multiplayer, a ludicrously low price-point, and all DLC is free. With a free weekend running on PS4 until 11pm Sunday CT / 5am Monday UK - comprising the first two campaign levels, all of multiplayer, and SnapMap - we felt it time to dive into a fresh re-appraisal. Doom is an excellent game. Easily one of the best FPS ever made, in fact, and as such, it received the easiest five-star review I've ever awarded. Delivering a huge, imaginative, brutally clever and endlessly evolving campaign, a raft of multiplayer modes, and the staggeringly deep SnapMap level editor, it all added up to a very generous and wonderfully crafted offering indeed. 'Added'? Past-tense? Yes. Because that was at launch. Doom is even bigger now. And it’s better, and even more complete. It has new modes, new options, new helpings of new content, and greatly updated versions of the great things that have been great since day one. So it’s time to revisit, reappraise, and re-recommend. 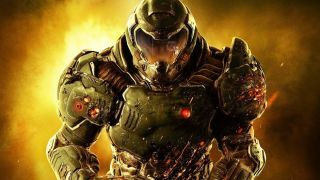 Because with the game's official, digital price now slashed to $14.99 / £11.99, the season pass cancelled, and all DLC now available for free, you need to be playing Doom, whether you're a lapsed Slayer or a burgeoning Doomguy still waiting to get started. Here’s the most basic level of Doom longevity. If you’ve only finished the campaign once, you haven’t finished with the campaign. Trust me. Yes, it’s long, and yes, it’s increasingly intense, and yes, by the time those – very cool – credits roll you’ll likely be curled into a giddy, foetal lump, sweating adrenaline and gurgling what feels like your last. But trust me. When you’re physically and emotionally capable, you will want to do another play-through. Because there are three wonderful, deceptively clever design elements at play in Doom’s campaign. First up, there’s the sheer unpredictability of it. However many times you play them, no encounter in Doom will play out the same way twice. The purely systemic cause-and-effect of Doom’s combat - driven entirely by AI, weapon and movement choice, and spiraling, unfettered causality effectively - makes the campaign an infinite Doom generator. There’s no ‘seen it before’ on subsequent play-throughs. There’s no ‘I know exactly how to handle this’. There’s just whatever’s going to happen this time. Secondly, there’s the pitch-perfect difficulty curve. You might think a play-through on Hurt Me Plenty is more than enough, but don’t be intimidated. You see, Doom’s difficulty settings – bar the ludicrously punishing gimmick of Ultra Nightmare – are tuned up to follow on from each other seamlessly. Finish the campaign on HMP, and you’ll find that you’ve calibrated yourself perfectly for Ultra Violence. And that won’t mean a simple rinse-and-repeat. Because the increased difficulty – fashioned by way of cranked up enemy damage and decreased pick-up values – combined with the entirely systemic way that Doom’s campaign combat plays out, means that you will get an even more intense, focused, demanding and rewarding flavour of Doom, ie. The Doom-things you loved about Doom will be even more Doom. It just won’t be anything like as punishing as you imagine it will. And finally, there’s the complete gameplay change afforded by different weapon load-outs. However hard you hunt for all of the upgrade droids in your first play-through, the chances are that you won’t unlock all of the secondary fire options on offer. And however many you do get, you’ll very probably spend the full campaign devising and honing particular weapon strategies for particular monsters and situations out of your immediate favourites, eking fathoms of depth out of effectively just half of the arsenal. This is fine. Because it means that when you do a second play-through, and switch to the other set, you’ll find that they’re a literal game-changer. You’ll be playing a whole different version of Doom, with different demands, different tactical options, and whole new kinds of fun. These things aren’t just tweaks. They’re a completely new dictionary of combat to use during your heated conversations with the slavering forces of Hell. So get back in there and use them. It’ll be great. And you know what? There’s another way to play Doom’s campaign. Added later as a free update, Arcade Mode completely changes the way Doom is played, delivering a streamlined version of the whole campaign – unlocking all weapons and Rune abilities from the start – with the only goal being to rampage through as fast, creatively, and destructively as possible, with medals, score multipliers, and leaderboard high-scores showering down upon you like the shiny golden rain inside Scrooge McDuck’s money bin (because come on, that thing has to have evolved its own water cycle by now). It’s Doom distilled. It’s Doom amplified. It’s the essence of Doom reworked and refocused into an even more pure, direct, and no-nonsense form. And you can rub your friends’ faces in it when you objectively dismember the great big monster faster and better than they do. So that’s good. Doom’s multiplayer is good, I promise. I know it’s come in for a lot of flack since the game’s launch, and I know the fashionable opinion is that it’s rubbish. But it’s not. Honestly. I’ve put in dozens of hours on it already, triple-prestiged with minimal fuss and even less compulsion to stop, and I’m not even a big online multiplayer guy. A bit of Halo, a fair old dash of Crucible, and that’s it. I do not get dragged into online shooters. Yet I’ve put more time into Doom’s multiplayer than I have a lot of whole games over the last couple of years. I think, possibly, part of the reason for the naysaying is that while Doom’s multiplayer looks superficially a bit like Quake, it doesn’t deliver a full Quake experience. I think that threw a lot of people off. And that’s understandable. After all, there’s nothing more jarring than something being almost like something you recognise, but not quite. And while Doom launched as a fast, anarchic, aerial-focused shooter with a recognisable weapon-set, it definitely is not the same as Quake. Its maps are more cramped, as much the product of choke-points and corridor stand-offs as wide, open, sky-high battlefields. But play for a bit longer, and let go your preconceptions, and Doom's multiplayer has a hell of a lot going for it in its own right. It’s the weapon load-outs that do it as much as anything. I know that many balked at the lack of a full, 12-gun set-up and multifarious timed weapon drops, but Doom’s load-out system, taking in a free choice of two weapons, a grenade, and a perk, brings a whole different type of depth all of its own. It’s ostensibly a big, broad arena shooter, but really it’s a much more intricate game of lightning-fast micro-strategy. With every FPS weapon archetype available, here’s a hell of a lot to think about in Doom, and with only two weapons to play with at any given time, there’s a hell of a lot of fun to be had in just experimenting to work out a favoured system. It looks brash and bombastic, but it’s an complex, and eminently player-driven game. And with Id taking over multiplayer design from Certain Affinity for the later (now entirely free) expansions, Doom has found a far clearer identity of its own. Newer maps are significantly more intricate, strategic affairs, the new weapons play beautifully and incisively into the layered, strategic meta-game, and the new Demon transformation abilities give the whole ecosystem a huge amount of fresh, tactical challenges to focus around. Not only that, but as of update 6.66, there's been a really nice overhaul to the mode's overarching structure. Now, ambient abilities are triggered by permanently equippable runes rather than consumable hack modules, meaning that favourite builds can remain persistent and are much easier to manage. There's also been a change to the unlock system for armour pieces and skin mods, whereby specific in-game challenges will let you go after any particular bit of kit you want, rather than waiting for whatever random drop comes as your next XP reward. Throw in a better, more informative UI, and the ability to dwitch between campaign and multiplayer much quicker, and you have a raft of great quality-of-life updates for an already great multiplayer suite. Trust me. Doom Multiplayer is fun. Give it another go. As well as the campaign and multiplayer, there’s yet another wave fresh new Doom pouring out of the SnapMap community daily. Doom’s replacement for modding, the SnapMap level building tools have only expanded, improved, and become more powerful (and fun) since the game’s launch. As a result, there is now a constant feed of new chunks of Doom, new spins on Doom, and whole new ways of playing Doom on the SnapMap suite’s community portal. You’ll find plenty of new, traditional Doom levels. You’ll find plenty of new co-op and vs. modes. You’ll find plenty of entirely new game ideas, built around Doom’s systems but offering completely fresh experiences. Interactive, action-sitcoms? Yes. Farming simulators with roguelike dungeon sections? Oh yes. Narrative walking-simulator RPGs? Plenty of those too. SnapMap is brilliant. You’re not going to find absolute gold each and every time you go in there, but over there long-term, there’s plenty of new stuff to play. And it’s not just about playing. There’s building to be done too. Doom’s campaign takes about 15 hours to finish, and I’ve spent at least that long working on one SnapMap level. And I loved every minute of it. Forget that the simple act of making things is always fun in itself. The sheer process of learning and understanding, reworking and breaking Doom’s SnapMap tool rules is a game all of its own. There is some seriously powerful stuff to plat with here, even on the most basic level, but once you get into the deeper, more complex – but still surprisingly accessible – possibilities, SnapMap will become a rabbit hole of creative discovery from which you might never escape. If you need convincing, just play through the SnapMap tutorial challenges. No dry, how-to presentations, these are a full-blown – and ingeniously designed - puzzle game. Offering a series of combat and traversal challenge rooms with ‘broken’ task criteria, they ask you to drop into the level’s editor mode (a simple button press away from immediate gameplay) survey how the room is built, how its rules work, and how its AI will respond to various different scenarios. Then 'all' you need to do is rework the level's design to make the challenge possible. Part instruction manual, part practical tuition, part shooter, and part Portal-style action puzzle, there’s enough fun in the challenge tutorials to keep you going for a whole evening or more, not realising you’re learning a thing, but feeling like a game design genius by the end. And with two new level-building room sets released since launch – adding outdoor, Hell-set environments and classic-Doom themed toys to play with - alongside a bunch of updated control options, your creative scope is now much greater than it was at launch.